A video of a woman going on an anti-Muslim rant at a niqab wearing woman and her husband in a west London supermarket has gone viral earlier this month. The footage filmed by the husband on July 31 and uploaded to Facebook by a family friend has since been viewed thousands of times. 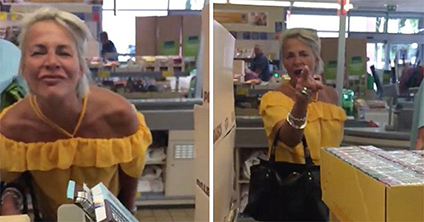 The fracas erupted by the checkout of an Aldi supermarket in Feltham, Hounslow, captures a white middle aged woman berating the Muslim woman for her attire. He then tells her that he “thinks her attitude is disgusting” as she responds “no” before telling him that “you should not allow your wife to go around like that”. The wife begins to interrupt by telling Turner “why should he be my boss, he’s not my boss.” While remaining calm, the husband says the ranting woman should educate herself but she responds by asking him if he knows the Qur’an. The argument continues in the fashion for around a minute until an off-screen voice, presumably a member of staff, tells the woman to calm down “otherwise you are going to get banned”. Not one person inside the busy store intervened on the couple’s behalf or reprimanded the woman for her unprovoked outburst.